Located at 97 Mt. 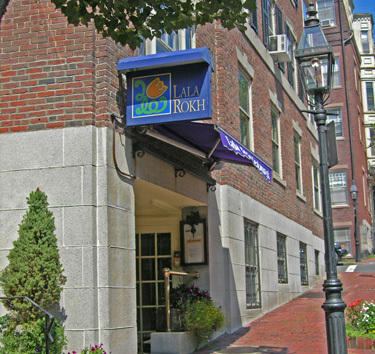 Vernon Street, Lala Rokh is truly a doorway to another world. Our name is the title of an epic romance by the 19th century poet Thomas Moore. In it he tells the story of Lala Rokh, a beautiful young princess on a journey of love and discovery. The book is the very epitome of European fantasies about the East. And our decor, which includes our family's collection of vintage 19th century photographic prints from two of the earliest Persian photographers, vibrantly colored textiles and tapestries of the late 18th and 19th centuries, still-life paintings from the 19th century and illustrations of historic Persian cities by European visitors that date from the 16th through 19th centuries, adds to the atmosphere of romance. Here at Lala Rokh we attempt to please your soul by pleasing the senses. This by what you see, smell, hear and taste. Join us as we celebrate our 15th anniversary.